I have been keeping abreast of the stories on your Blog as they have unfolded just like a bandhani which is worn, then folded and then out it comes for another special occasion. Bandhanis were made with tying beads and grains ... how innovative that is! Just imagine how creative the human mind is! Of course then there are evocative memories of there always being a Moti Bai in one’s life. Mama Khalele. Who made the most amazing darbhajia I have never tasted those again. What with the heat of the sagri , the ijar just peeking out of the long khanzu and sweat too! Christian Steckler of Preview Vancouver has given this book an amazing review. Well deserved. I shall savour and have the luxury of reading the marked chapters. My mother used to make TASBI NA FUMKA with beads so we were frequent shoppers at the Rajan Lalji shop. My mother would even bargain! 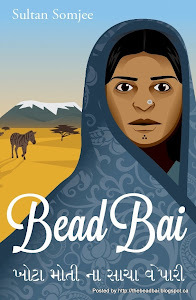 Reading parts of Bead Bai, I have tears in my eyes as I try to recall the tune of. Evi ruri che saheb jine mari bandhani. I can hear the voice of my late mother and her clapping. Nay we would do the RAS. She in the centre for her pace was faster than mine her bow lower than mine. Because I was mimicking whereas my mother was bowing to her Mowla and experiencing the love with which Mowla draped the BANDHANI protectively around her. The lady with the harmonium, Guli Bai, did indeed have that faint white strand that caught the light as she bent over the harmonium. Her hands pumping in the rhythm. My mother’s steps and our combined voices urging her to repeat this vein and then add her own improvisation as the RASS of ecstasy swallowed us all in that rapt adoration. Known only to those who know what it is to love with mind body and soul in movement and in song and transcending rhythm. I also recall my mother always had the vision of LAL CHUNDANI. And indeed at her death we wrapped her earthly body in one. A final farewell to her final garba for her Mowla whom she had joined many times and now the ceremony was complete in final union. The virgin soul finally united. How rich in symbolism are our beets and bar as and ginans. Fast disappearing, but ah the memory! It's so generous of you to share your feelings evoked by parts of Bead Bai. Please keep on writing them down as you read the book. Your thoughts are so vivid and alive like the characters in Bead Bai. Thank you for sharing what reads like 'on the spur of the moment' reactions.